In August, the National Oceanographic and Atmospheric Administration (NOAA) upgraded Tropical Storm Gaston to Hurricane Gaston. This in itself was not unusual—NOAA upgrades and downgrades storms often—except that this time it did so as a result of data gathered by a NASA-owned Global Hawk, a high-altitude drone. On October 4, the Global Hawk went into action again, flying over Hurricane Matthew as it moved across the Caribbean. The Global Hawk was joined in the weather event by a number of small Coyote drones, which flew at lower altitudes through the storm. For hundreds of years, unmanned aircraft in the form of kites and balloons have been used to make predictions about the weather, but the August Global Hawk mission was the first time a drone helped make a national hurricane prediction, a significant milestone that reflects the growing role that this technology plays in meteorology. From U.S. Navy underwater drones recording ocean temperatures off the coast of California to microdrones circling over tornado-ravaged Oklahoma, unmanned vehicles are promising to become a common tool in the ongoing job of trying to understand and predict the weather. Here’s what you need to know about weather drones. The earliest unmanned aerial vehicles used in weather science were thermometer-equipped kites, first flown in Europe in 1749. Kites carrying geared “meteorographs,” automatically recorded pressure, temperature and relative humidity, were widely used until the early 1930s, when radio-meteorographs, or “radiosondes,” that could be carried aloft on free balloons and transmit readings from the stratosphere were introduced. 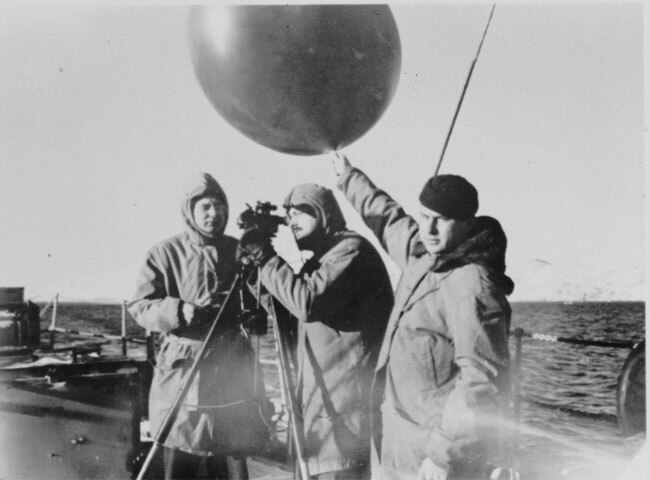 In 1937, the United States Weather Bureau, forerunner to today’s National Weather Service, established a network of balloon-launched radiosonde stations that remain in use today. The first successful weather satellite, the U.S. TIROS 1, launched in April 1960. This marked the advent of weather forecasting on a global scale. Today, satellite imagery and sensor data, combined with readings from ground-based radar, manned flights and weather balloons, are synthesized in complex statistical models and analyzed by powerful computers. In 1991, NASA acquired the Perseus unmanned aircraft, one of the first advanced weather drone programs. Perseus became a centerpiece of NASA’s Environmental Research Aircraft and Sensor Technology project, which launched in 1994. The high-altitude, low-speed Perseus was designed to cruise at 60,000 feet (compared with a 10,000-foot ceiling for manned hurricane hunter aircraft) for as long as 24 hours in order to monitor ozone depletion and weather patterns, including releasing dropsonde devices to gather data on hurricane development and intensity.. NASA was particularly interested in flying the system over particularly remote areas that would be dangerous for a manned aircraft to traverse. Though the Perseus B variant reached a record 60,280 feet of altitude in a flight in 1998; ERAST was eventually canceled in 2003. Predictions and severe weather warnings have improved significantly over time (see this chart of prediction accuracy over the decades from the U.K.’s Met Office). But today’s supercomputer-powered weather models are still only as good as the data they process. As NOAA puts it on its website, the “quantity and quality of observations” can always be improved. Agencies such as NASA and NOAA are investing in a range of initiatives to gather better forecasting data and contribute new knowledge to pressing climate questions. Many of these initiatives leverage unmanned systems technology. Small unmanned aircraft can operate in the “lower atmospheric boundary layer” of the troposphere, the first several hundred feet above ground, which is where most weather events that concern humans occur. This atmospheric layer is too low to be studied reliably and safely with manned aircraft. Unlike unsteerable weather balloons, which pass quickly through areas of interest, especially during storms, drones can loiter in a particular area of interest. Large drones like the Global Hawk or certain unmanned undersea systems can operate for long periods of time—in excess of 24 hours—because they do not have an onboard human crew. Unmanned systems are also relatively inexpensive to purchase compared to systems such as airplanes, boats, submarines, and satellites. -One of the earliest applications of modern drones to severe weather research came in the late 1990s and early 2000s, when scientists at Taiwan’s Central Weather Bureau and National Taiwan University experimented with several Aerosonde Mark I aerial drones as typhoon hunters. After numerous failed operations, a 2001 flight into Typhoon Haiyan produced results of scientific value, though the system later crashed near the storm’s outer core. This program is ongoing; in 2015, Aerosonde delivered three unmanned aircraft to the Taiwanese government for weather research. -In 2010, NASA acquired two Northrop Grumman Global Hawks from the U.S. Air Force, one of which was the first Global Hawk ever built. In August 2010, a NASA Global Hawk launched from Edwards Air Force Base in California, completed the first high-altitude drone flyover of a tropical cyclone when it intercepted Tropical Storm Frank in the Pacific Ocean. Only a few days later, the Global Hawk marked the first drone flyover of a hurricane, crossing the continent to monitor the developing Hurricane Earl in the Atlantic Ocean, part of NASA’s Genesis and Rapid Intensification Processes (GRIP) experiment to examine how tropical storms develop into hurricanes. -In February of 2016, the NASA Global Hawk flew over the remote equatorial Pacific to gather data on this year’s El Niño event. -Anyone can track NASA’s drone missions in real time with this NASA Airborne Science interactive map. NOAA has demonstrated great interest in weather-surveying drones. 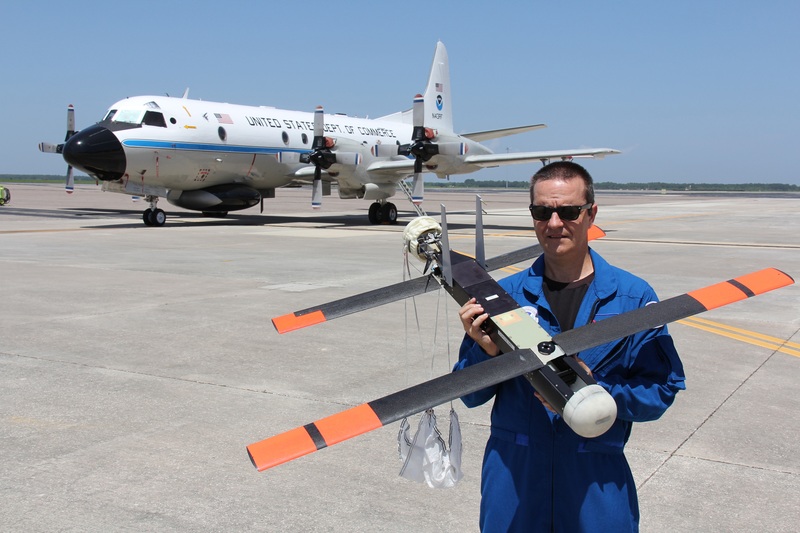 One program officer stated that drones “will revolutionize NOAA observing strategies comparable to the introduction of satellite and radar assets decades earlier.” NOAA’s Unmanned Aircraft Systems program, launched with $3 million in funding in 2008, covers three mission areas: high-impact weather monitoring, polar monitoring and marine monitoring. The program maintains three pricipal goals: increase unmanned aircraft systems observing capacity, develop high science-return unmanned aircraft missions, and transition unmanned aircraft systems into routine operations. A centerpiece of the NOAA drone systems program has been Sensing Hazards with Operational Unmanned Technology (SHOUT), a continuation of NASA’s HS3 mission that is also being carried out using the NASA Global Hawk. SHOUT’s mission is “to determine the best observing strategies, assess operational effectiveness of UAS to mitigate the satellite data gap.” The flight over Hurricane Gaston, this August, was part of the SHOUT program. 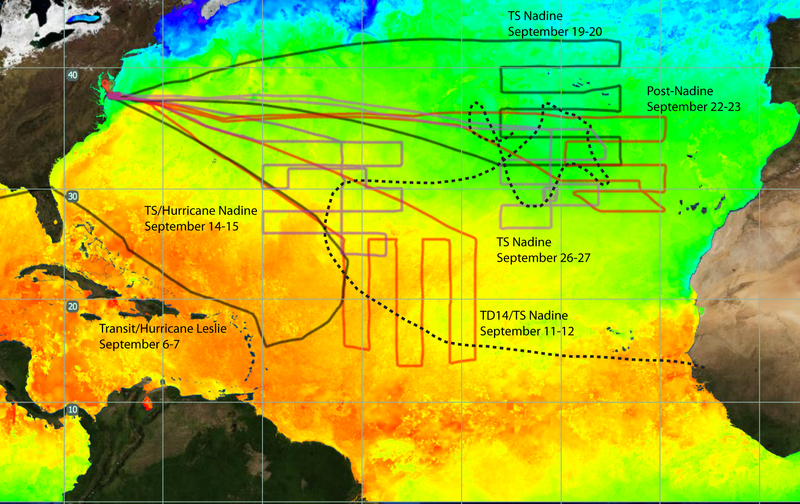 Although SHOUT flights were set to end in September, the arrival of Hurricane Matthew in October convinced researchers to extend the mission. On October 4, the Global Hawk flew from NASA’s Armstrong facility in California to track down the storm in the Atlantic Ocean north of the Bahamas. NOAA maintains a program, in collaboration with Raytheon, to drop Coyote drones directly into the eye of a hurricane or the surrounding eye wall. The Coyotes are packed into three-foot-long sonobuoys, then dropped from the belly of NOAA P-3 hurricane-hunting aircraft. As they fall, the Coyotes spread their wings and take off. The unmanned aircraft can travel 50 miles or more from the host aircraft, which can continue to perform other mission tasks while receiving data updates from the Coyotes. In the Arctic, NOAA has tested ship- and land-deployed Manta, Puma, Aerosonde, ScanEagle, and Flexrotor unmanned aircraft for a wide range of missions, including atmospheric boundary layer research, sea ice ridge detection and tracking Alaskan wildfires at night. NOAA has also extensively studied drone recovery methods, including tests of water, ice and ship deck landings, along with net capture systems. Meanwhile, NOAA’s North Central River Forecast Center (which covers the Hudson Bay, Upper Mississippi and Great Lakes drainages) has used an MQ–9 Predator on loan from U.S. Customs and Border Protection for river flood monitoring and protection. The program monitors for dam breaks, ice jams and levee failures. NOAA also plans to use infrared imagery from the Predator to study the impact of manmade “tile drains” on farmland near flood-prone rivers. NOAA’s EMILY is a 65-inch-long unmanned surface marine vehicle that carries sensors and a high-definition camera for hurricane research missions. It is remotely piloted using a satellite data link, cruises at up to 7 knots, and runs for up to 10 days with battery and gas motor. EMILY gathers data on surface temperatures, salinity, and wind speed and direction from within storms. NOAA is also testing the 19-foot-long Saildrone autonomous unmanned surface vehicle as a research platform to collect air and water measurements. The agency plans to use the system to gather data around the El Nino and La Nina ocean warming/cooling events and global warming patterns. The U.S. Navy is developing five-foot-long autonomous vehicles called Slocums that can reach a depth of 4,000 feet to collect constant readings on water salinity and temperature. According to the Navy, a planned fleet of more than 150 gliders would enable accurate long-range forecasts of up to 90 days. Researchers with Oklahoma State University’s Unmanned Aircraft Systems program are working on a new kind of drone, specifically for studying atmospheric conditions, that is simple and robust enough to become a “common, useful everyday tool.” In 2015, the team received a $6 million grant from the National Science Foundation (along with three other U.S. universities) to develop small, reliable and inexpensive drones that can sample readings for hours at a time in a wide range of areas—supplementing or even replacing manned meteorology data collection platforms.